Day 1. Meru National Park - Depart Nairobi past Central highlands i.e Embu/Meru towns to Meru National Park. Afternoon bird watching. Dinner and overnight at a lodge or Campsite. Day 2. Meru National Park - Full day bird watching, all meals and overnight at a lodge or Campsite. Day 6. Lake Baringo - Early morning bird watching before departing for lake Baringo in the afternoon. Dinner and overnight at a Lake Baringo Club or Campsite. Day 7. Lake Baringo - Full day bird watching. 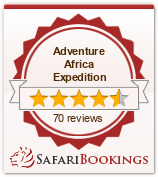 All meals and overnight at a Lake Baringo Club or Campsite. Day 8. Breakfast at lake Baringo and depart for lake Naivasha to arrive in time for lunch. Afternoon bird watching . Dinner and overnight at a Lake Lodge or Campsite. Day 10. Nairobi - After breakfast return to Nairobi. Dinner at carnivore restaurant .Overnight Nairobi hotel.